Now this is what I call a SALAD. I’ve hit that point in my pregnancy where I’m really into SALADS. Yes. All caps necessary. How weird. Right? I mean, do people normally get into salads while pregnant? I’m into this grilled kale avocado salad like no other. IN TO IT. At the beginning, I told you about one of my most embarrassing cravings which was basically a Pittsburghese salad of iceberg and lettuce and topped with tons of cheese and fries and vinegary dressing. I ended up having it once and wanting to die mid-way through. THANK GOODNESS THAT IS GONE. I’ve been in love with grilled romaine salads for years. Years! The smoky flavor that the grill gives… oh it’s just so good. So I did the same with kale. It only needs a minute or so on the grill and you get a whole boatload of taste. Completely worth it. Our dressing here is a creamy avocado one. Which is so unlike me! Creamy dressings aren’t my thing. I liiiiive for oil and vinegar. In fact, you know that I’m such a vinegar freak, I could drizzle my salads with vinegar alone and be thrilled. But the creamy avocado dressing with the grilled kale… oh yes. I have no words. It’s smoky and cooling and refreshing and the best ever. Why do I have no words today? Just lots of exclamation points. The avocados ON the salad also made their way to the grill! Yesssss. The chickpeas are crispy and roasted in the oven. 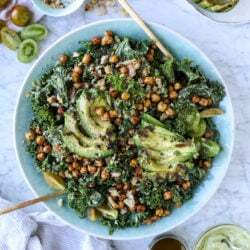 If it’s a still a million degrees when you make this salad, feel free to leave your chickpeas unroasted so you don’t have to turn on your oven. But! The best part, really, are the garlicky, crunchy breadcrumbs. Oooooh they add so much flavor and texture and you’re just like, WHAT is that. Basically this salad is the brainchild of my texture loving palate. Lots of crunch. Now yes… there are a lot of moving parts to this salad. Grilling the kale, making the dressing, the breadcrumbs and the chickpeas. It’s a leeeettle bit high maintenance and you can totally leave one part out if you’d like. But if you have the time and the appetite – go for it! Then we can just eat it and be besties. Preheat your grill to the highest setting. Drizzle the kale with a tablespoon of the olive oil and massage it into the leaves. Sprinkle with salt and pepper. Drizzle the avocado with the other tablespoon of olive oil and sprinkle with the salt and pepper. Place the kale pieces on the grill along with the avocados, cut side down. Grill both for 1 to 2 minutes, until the lettuce becomes charred, then flip over for an additional minute. Grill the avocado just until grill marks appear. Remove both from the grill. Tear the kale leaves from the stems and toss them with the avocado dressing – as much or as little as you’d like! Slice the grilled avocado and add it on top. Cover with the cherry tomatoes, chickpeas, breadcrumbs and more dressing if you’d like. Add the butter and olive oil to the saucepan. Once melted, add bread pieces and stir well to coat and combine. Sprinkle with garlic powder and salt. Stir constantly over medium-low heat until the crumbs are golden and toasty. Place chickpeas on a paper towel and pay completely dry. Remove any loose skins. Place on a baking sheet and mist with olive oil or oil of choice. Roll around to coat. Sprinkle with salt and pepper. Make sure chickpeas are in a single layer. Bake for 15 minutes, toss well and flip, then bake for about 15 minutes more. Let cool before using. Yum, looks and sounds great! I’ve never grilled kale before, but I can imagine it would truly bring out and enhance the flavor. I also love the homemade dressing! um this might be completely insane but i’m going to make this and try to GRILL THE CHICKPEAS TOO!!!!!!! it’s 7 am and i’m dreaming of grilled kale and grilled chickpeas (which may not even be a real thing?!) and avocado dressing & i can’t WAIT to try this!!! i think that would be awesome, i also want to try!! Give me all the grilled salads! This looks really tasty, plus I bet you could make a ton of chickpeas at once and have some for snacking later. Love this! This looks perfect – I’m also at the point in my pregnancy where I want salads all the time. And fruit. Anything too heavy sounds gross! Will definitely be making this! This salad looks so amazing! When you grill the avocado, is it just peeled & cut in half? You mention slicing it after it comes off the grill, but I don’t see how to prep it for the grill. OMG. This sounds insaneellyyyy good! I already made this tonight and it was so good. Most of your recipes I find myself making the same day you post them! Love your blog! This makes me want to eat a salad. hey girl- this salad looks so yummy! curly kale, avocado, blueberries and toasted unsweetened coconut flakes. Squish the avocado into the kale first (this “dresses” the salad, S&P to taste), then mix in the rest. Sometimes I also add pepitas for texture, or black or garbanzo beans for extra protein. So good. Pregnancy and salads? My experience was the polar opposite. Normally, I love salads, but this last pregnancy (baby born 6 months ago), salads became one of my food aversions. It was a sad time. This salad is perfectly timed. I was trying to figure out what to do with a bunch of kale my cousin gave me. I also have avocado and chickpeas on hand. Perfect! i know, super weird right?! thanks cidalia! I don’t have a grill, do you have a recommendation for how I might be able to make this? The salad looks great! Made this tonight and couldn’t wait to leave a comment! It was fantastic! And yes, okay, I cheated. I did not have any chickpeas or breadcrumbs so I just made the grilled kale with avocado dressing and sungold tomatoes. My only disappointment is that it is all gone. Fantastic! I got to use fresh organic kale from my parents’ farm and the recipe did it justice! My only question is how long one can keep the dressing for in the fridge? The recipe made a ton and I didn’t use all of it.